Discover the lasting beauty of fine antique table silver. Matched silver sets are beautiful, but many of us collect silverware over the years and collect many different patterns. Embrace the variety by displaying mismatched patterns and enjoy each individual intricate pattern. Your table is a creative canvas where you can display the treasured silver servingware you’ve gathered over the years, especially during months filled with celebrations, intimate dinner parties and holiday feasts. The tradition of fine dining is once again au courant, and there’s never been a better time for those of us who appreciate a beautifully set table. 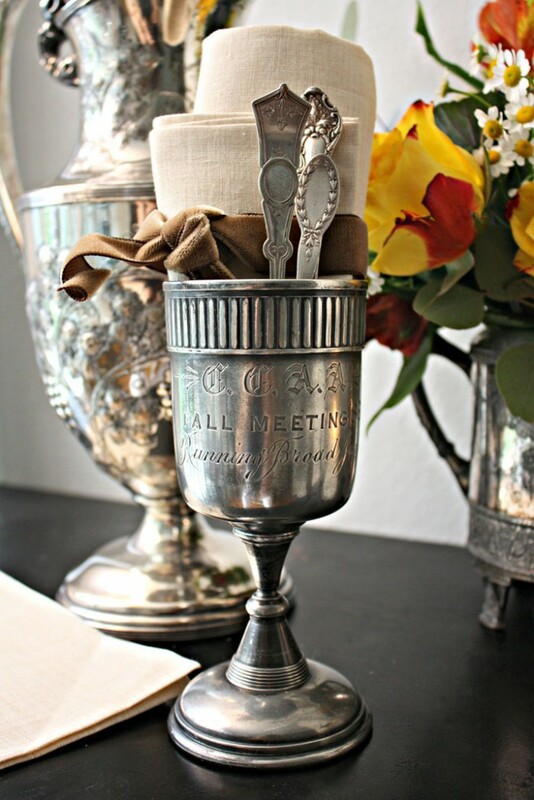 Antique silver trophy cups, those engraved with the long past accomplishments of celebrated people, are a unique glimpse into the past and fun addition to any tablescape. Silver, sterling or plate, closely associated with elegant dinner table settings, has a history that goes further back than the gleaming silver we remember from our childhood holiday table. In fact, the tradition of sitting down for an enjoyable meal with family and friends dates back as far as civilization, but dining tables were not set with silver until the early 19th century. During the Renaissance, knives were the primary utensils used during meals, along with a wooden spoon. Forks were introduced as early as the 11th century, but were extremely controversial, scandalous and considered heretical, not gaining widespread favor in Europe until well into the 18th century. 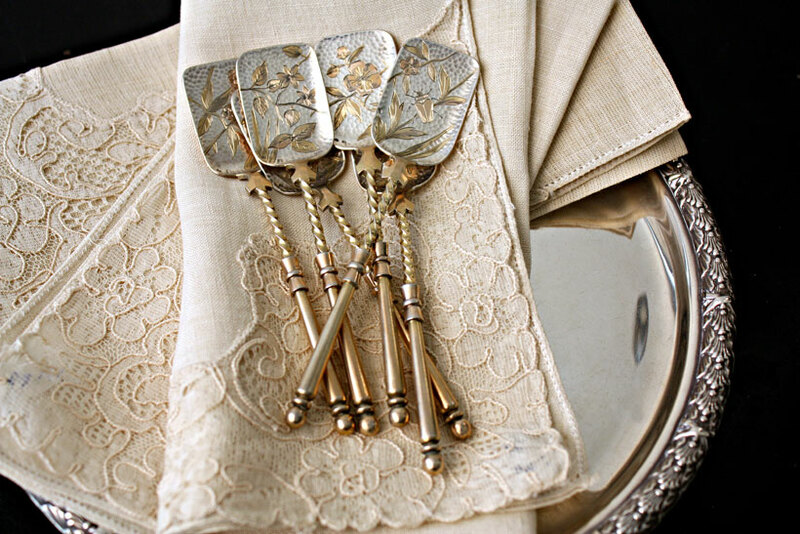 Mixed metallics, like the touches of gold-tone on the these utensils, adds extra color and detail to the vignette. It wasn’t until the 1800s that dining came into “the gilded age” and silver for the table was plentiful. Wealthy hostesses of the 1800s set their tables with lustrous silver serving dishes and a bewildering assortment of flatware. A single place setting at a formal dinner might have included at least eight different forks, eight knives, numerous spoons, a butter pick, game shears, nut picks, asparagus tongs and salts. 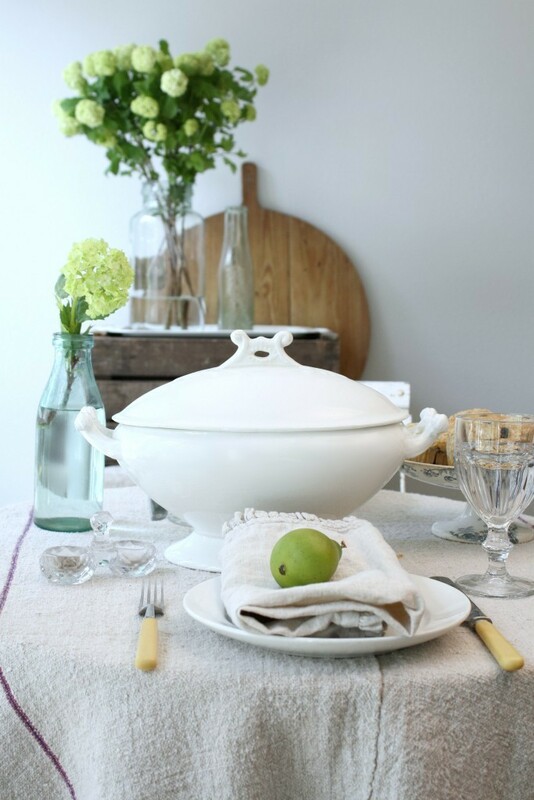 Collect what you love and appeals to you, a glorious mix of bowls, tureens, ladles and silverware that pays homage to your personal style. Mixed in with what you already own, these elegant luxuries add glamour to your table’s setting. Collectors love sterling silver because it keeps its value. 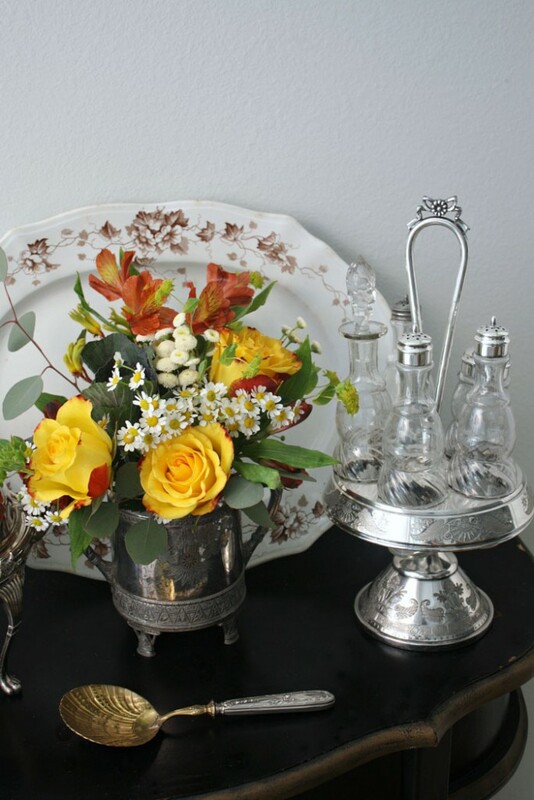 But a collection of silver plate will bring just as much beauty to your table. Silver is considered a “cool tone.” Lidy added warmth to her sideboard vignette by adding bright yellow and red blossoms. Elegant, sophisticated and long lasting, silver serving bowls, domes and flatware elevate any setting to party status. We have a great advantage over our ancestors in that we can enjoy the beautiful silver pieces they did, but we’re not stuck with their rules. 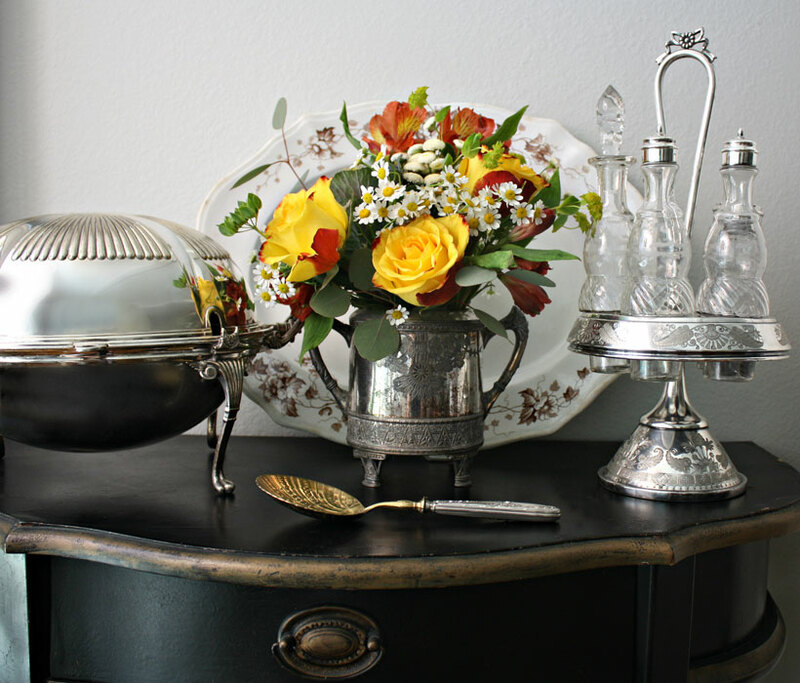 While our grandmother would never mix and match place settings or combine antique silver with contemporary dishes, today we enjoy all the charm antique silver brings to the table, free from those rules. Quality. Become familiar with high quality. Sterling is almost always marked, either with the word STERLING or the lion passant. Do your research; you can find most sterling makers’ marks on the Internet. Most plated silver from the 1800s is marked Quadruple Plated. If you love a piece and want to use it for serving, but it is corroded inside, consider having a silversmith replace the interior. 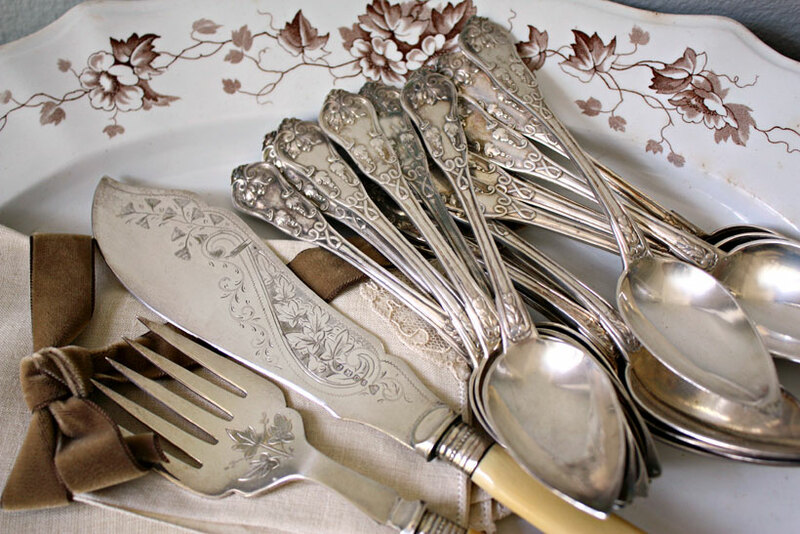 Intricately detailed patterns make collecting antique silverware a captivating hobby. Style. Opt for designs you love. Pieces with a logo, monogram or beautiful hand-chased floral engravings add charm. It doesn’t all have to match. If you love it, it will work together. Condition. Buy silver in good condition. I suggest you buy silver that is pre-polished, especially silver-plate, so way you can see how much loss to the plating there is. Some loss is fine, but most of the silver should be there. Do remember these pieces are often over 100 years old, and will not be perfect. That’s part of their charm. 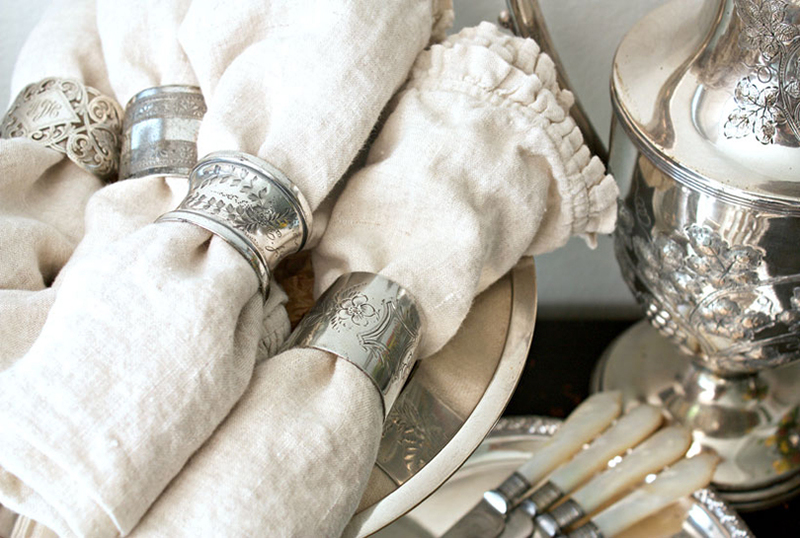 It’s easy to start collecting antique silver but focusing on smaller, everyday items like cutlery. As you learn and discover more about silver, keep your eyes open for unique pieces, such as this salt, pepper, oil, and vinegar set. You can start enjoying antique silver in small ways. Perhaps you are fortunate enough to have inherited your grandmother’s silver, or received the gift of a set of six spoons. Set your well-appointed table with pleasure; it will bring people together and provide comfort as well as joy. 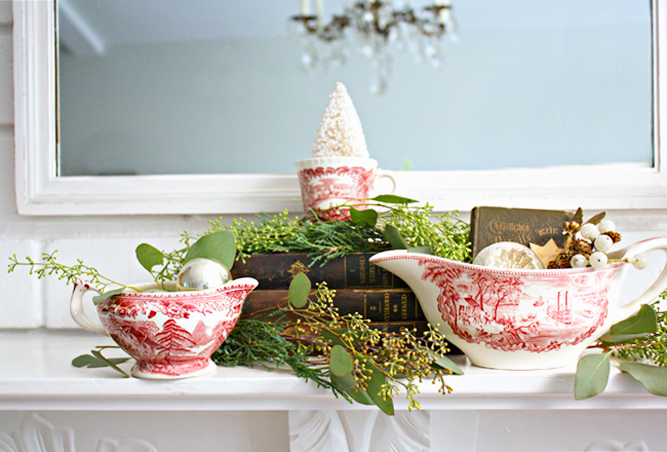 Make a statement on your holiday table with classic transferware dishes. 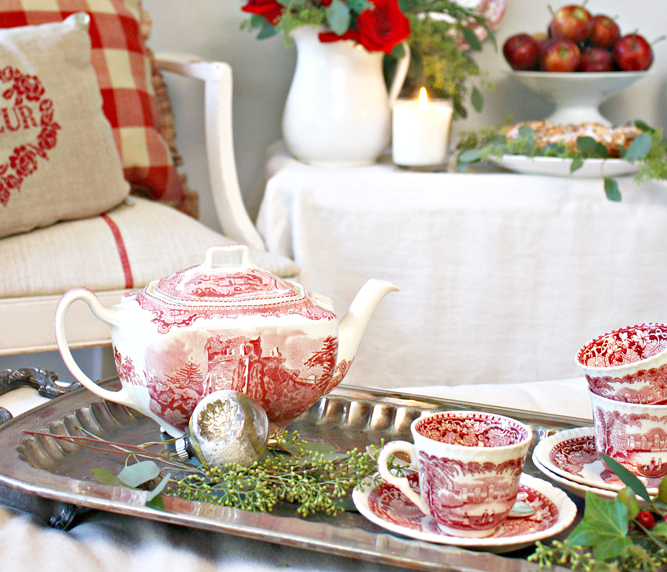 Transferware comes in many colors, but during the holiday season, red is our color of choice! Temptingly graphic with stories to tell, antique transferware comes into its own at holiday time. With elaborate borders and endearing scenes, each piece of transferware pottery is a miniature work of art. A few pieces grouped together or a large collection displayed en masse make an exquisite decorative statement. 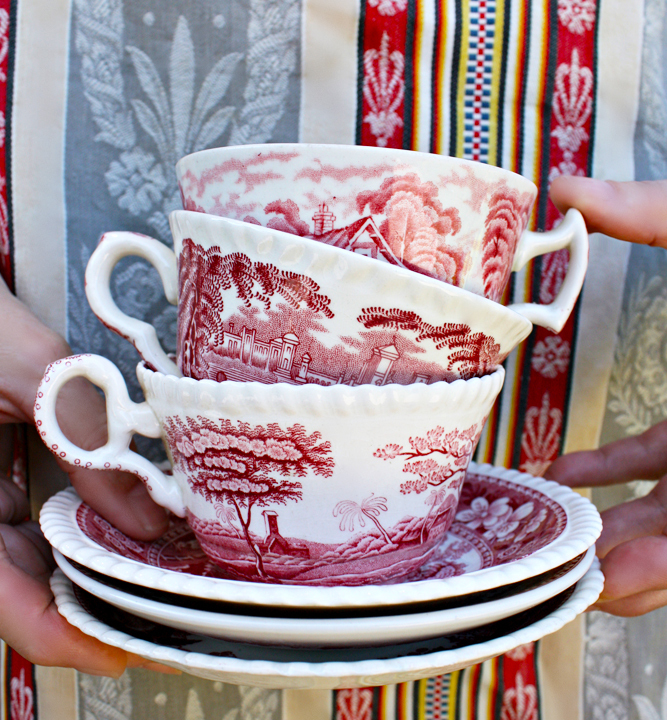 Transferware, with its subject matter, technique and colors, is timeless—a classic that is admired just as much today as it was in the 18th century. Transferware is a type of pottery that is decorated by a process developed in England in the mid-1750s. To produce each colorful design, a master pattern was engraved on copper, glazed with color and transferred to thin paper. These sections of paper were applied one by one to a piece of pottery before the piece was put into the kiln. Many patterns were so complex that it took over a month to engrave the copper master sheet. 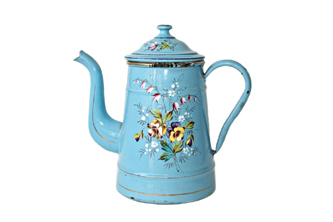 Transferware was made all over Europe and the United States in many colors and patterns. 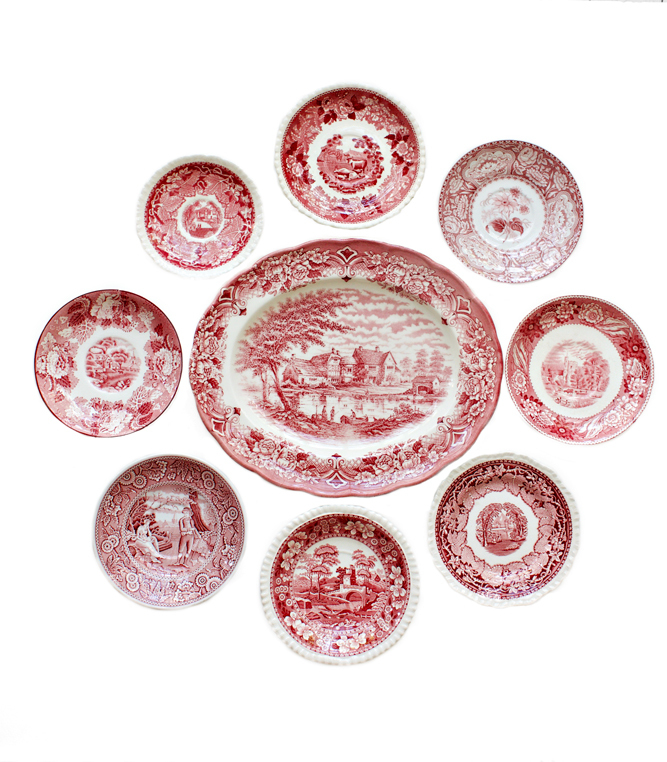 Before transfer printing was developed, each piece in a dinner set had to be painted by hand, a costly process, making decorated dishes completely out of reach for working class families. The industrial revolution in England changed that. The transfer process meant pottery patterns could be reproduced repeatedly, allowing middle class families to enjoy appealing dinnerware similar to that found in the homes of the gentry. By the 1800s, factories were producing entire tableware sets, most in romantic patterns featuring a man and woman in lush landscapes. 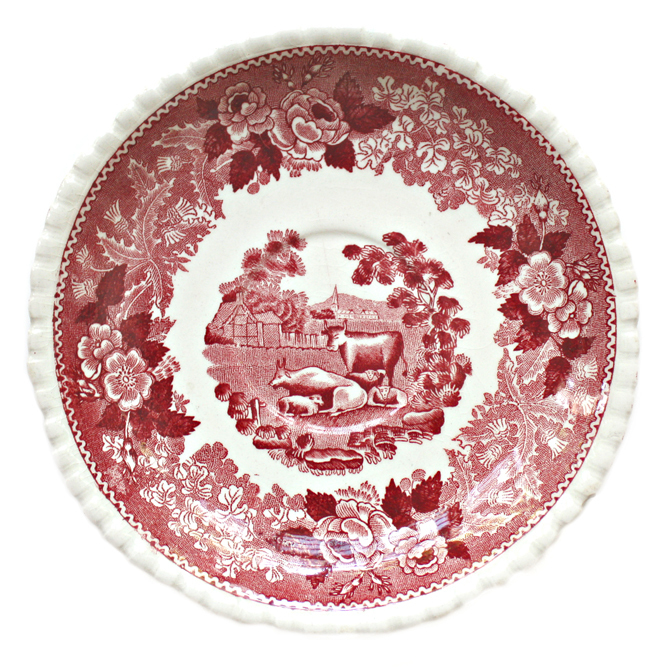 Most transferware on the market today is from the mid to late 1800s. Especially appealing are pieces from the late 1800s Aesthetic Movement, when artists believed that creating something for beauty alone justified their artwork. Look for Oriental patterns, free-flowing asymmetrical designs, lavish florals and garden scenes filled with exotic birds, trees and lush landscapes. Most transfer pieces are marked on the bottom with the maker’s mark, and often with a pattern name. Some early pieces are unmarked; they are just as valuable. The older the transferware, the more “misses” you will see where the pattern joins at the seams. Unless it truly is a huge miss, this does not devalue a piece. Prices can range from a lucky find at a flea market for well under $100.00 to thousands at an auction house, depending on rarity, size, and who else wants to add that piece to their collection. Of all the colors of transferware, yellow was the least produced, therefore the most rare and costly to acquire. Next time you come across a striking platter, bowl or cup, don’t hesitate to add it to your antique collection. 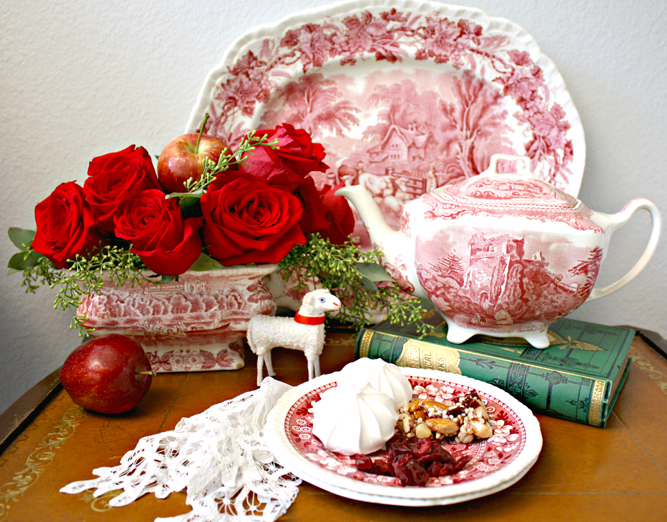 The darling of decorators, transferware is decorative as well as useful. Whether you display your collection on your walls, or set a holiday table, these pieces have survived for over a hundred years and are meant to be used and bring joy. Try saying "she collects vintage seashell accessories" three times in a row as fast as you can. 19th century English decorative boxes made in the shape of furniture are the most collectible of the Victorian shell boxes and are rare to find in good condition. Treasures of the sea, shells add a touch of seaside panache to any room. Collecting shell accessories such as art or decorative pieces is an enjoyable hobby, and there is a range of shell collectibles to choose from, both antique and contemporary. Shells, with their memories of joyful summers at the beach, have enchanted us since the beginning of time. There is a range of shell collectibles to choose from, both antique and contemporary. These mementoes of the ocean have a quiet, understated beauty that connects us to the natural world. 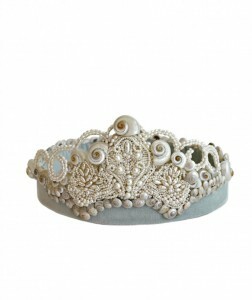 A one-of-a-kind mermaid bridal tiara is covered in hundred of miniature mother of pearl shells and the tiniest seed pearls. Once prized as rare artifacts with magical qualities, exotic shells brought to European shores by the Dutch East India Company stimulated an avid passion for collecting them in the 17th century. Wealthy collectors gathered costly collections of shell specimens for their private museums. Cabinets of curiosity, rooms outfitted with display cases and shelves to display natural and botanical treasures, held a fortune’s worth of shells. Shells were so prized in the early 18th century that they were sold at auction, rivaling paintings by Dutch masters in cost. Royal houses around the world had grottos created at their palaces and chateaus covered in shells. It wasn’t until the 19th century that shellwork came into fashion for upper class ladies. Suddenly, covering smaller objects with shells became a popular craft; little packets with shells and designs for shell boxes, frames and floral designs were sold en masse. Souvenirs covered with shells or made of shells became a cottage industry in coastal towns around the world during this time. Mostly designed for women, the small boxes, sewing drawers, little frames and other small shell mementoes could be bought inexpensively and tucked into a sailor’s “kit” to bring back home. The port of Barbados is thought to be the place where the sailor’s valentine, a two-sided wood case filled with shell work, originated. This 19th-century shellwork souvenir box was created especially to hold lustrous strands of pearls. Shell variety, shapes, natural colors and pearlescent sheen bring beauty to any interior. 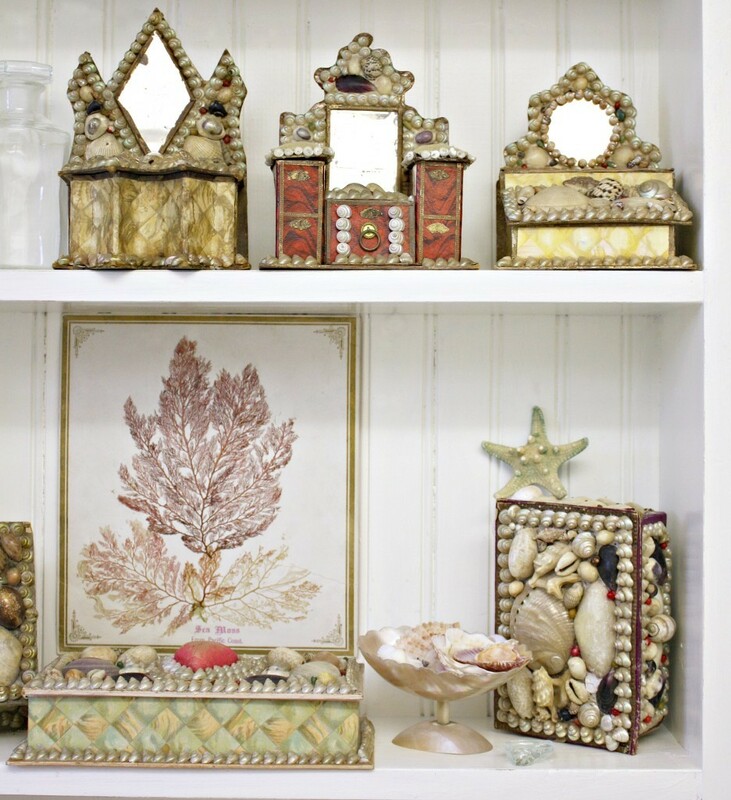 You can focus your shell collection on Victorian era boxes, frames and pincushions, or collect pieces from the few shell artists still actively creating today. Both kinds of objects will add the beauty of the sea to your home. But how to tell the difference? 1. LOOK AT THE SHELLS. True antique shellwork will have shells that are rare to find today. Pelican’s feet shells, for instance, used on many pieces from the 1800s, are now all but extinct. The shells that are on antique pieces won’t be perfect: a little dull, a little chipped perhaps. Newer shell pieces will have much brighter, cleaner shells, more evenly matched in color and size. 2. LOOK AT THE MATERIALS. Authentic antique shell art is most often made with paper-covered carton boxes. The shells are often either glued on with a waxy substance or set in a thin layer of gesso. The shell artists of today use a clear, strong glue. 3. LOOK AT THE CONDITION. Antique shell art was created with delicate shells, which may have a little damage after 100 years. Contemporary shell art pieces will have beautiful, clean and strong shells. TO BEGIN A COLLECTION OF SHELLS: First, be sure to find out if it is legal to gather shells in your area. Be careful to collect only “dead” shells, or shells that have washed up on the beach. Please don’t harvest sea shells still being used by mollusks and other creatures: Doing so will damage the ocean’s ecosystem. To shop Lidy’s vintage style, visit frenchgardenhouse.com. Polished to a shine, the gleam of this silver teapot is a beautiful contrast to the rustic wood tray on which it is placed. Lovingly polished to a lustrous shine, antique silver teapots are a living record of the skill and devotion with which craftsmen decades ago designed and made functional objects for serving tea. A collection of silver teapots imbues a home with timeless grace and lends a sense of tradition to contemporary interiors. Join the thrill of the hunt, and begin (or add to) your collection. Antique silver teapots are not only beautiful to look at, but they are still very usable and have a fascinating history. Tea was brought to Europe by Dutch and Portuguese traders in the 17th century, a beverage only the very well‐todo could afford. Some scholars believe the design source for early teapots came from Islamic coffee pots used in the popular coffee houses in Europe, as for quite a few years teapots were in that same tall shape. Others believe teapot design was influenced by Chinese wine vessels, round in shape, which were shipped along with the teas from China. Pots were initially made of clay or porcelain. 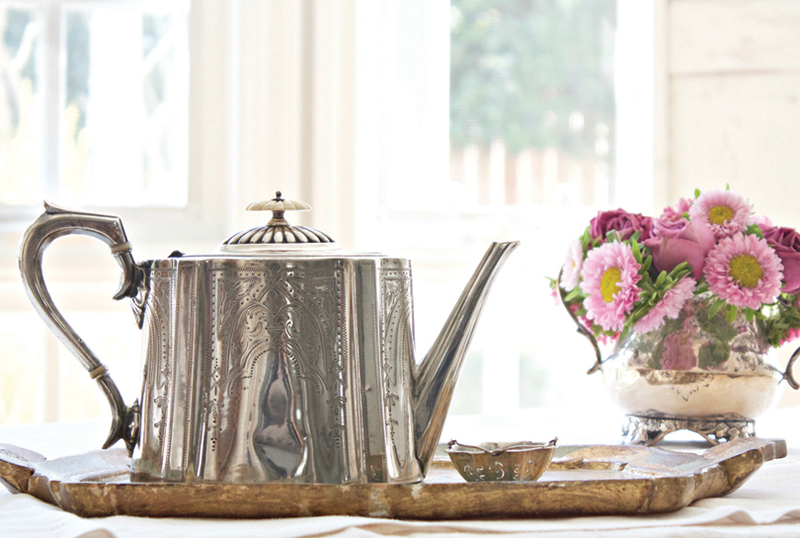 It wasn’t until the reign of George II in the mid‐ 1700s that silver teapots began to appear. Silver was durable, retained heat and could be embellished with engraved designs, embossed floral patterns and exquisite monograms, making each one a small work of original art. A silver teapot was among the most cherished possession of its owner; it sparkled in the light when used and was a symbol of the owner’s prosperity and social standing. The pots were also a form of cash reserve: the silver could be melted down and used as currency should the need arise. Designs changed from simple round shapes to straight‐sided shapes, which were then replaced by oval shaped teapots in the late 1700s. In the 19th century, Queen Victoria popularized taking afternoon tea for every class. Industrialization allowed less expensive, silver‐plated teapots to be produced for the middle class, so they could serve afternoon tea in as gracious a manner as they could afford. Every major trend in style was reflected in the silver teapots produced during the 1800s and early 1900s including Renaissance, Gothic, Chinese, Arts and Crafts, Art Nouveau with its fluid floral motifs and Art Deco. Whether you collect one style or all of them, a beautiful pot added to your collection will never lose its luster! A collection of antique silver teapots keeps its value, will bring you great joy and is something you can pass down to your children and grandchildren. As a bonus, your collection will bring inherent beauty to life’s most meaningful occasions. CONDITION: Depending on your budget, look for the best sterling or silver-plated pots. Buy pots with glowing patina, a beautiful shape, and pieces that are largely undamaged. Some wear is to be expected on plated pieces that have aged. IDENTIFICATION: Most antique pots will have a hallmark, or be marked sterling or quadruple plate. BUY WHAT YOU LOVE: Monograms, floral designs and elegant shapes all make a pot desirable. But it is the “love at first sight” phenomenon that should help you decide to add a piece to your collection. Lidy Baars not only writes about antiques, but she collects and sells them as well. Visit her blog FrenchGardenHouse.com to see what’s new!